​Melt butter in a nonstick skillet over medium heat. Add Brussels sprouts to pan, cut side down; cook 2 minutes, without stirring. Add garlic to pan; toss to combine. Cook 2 minutes. Sprinkle with salt and pepper. 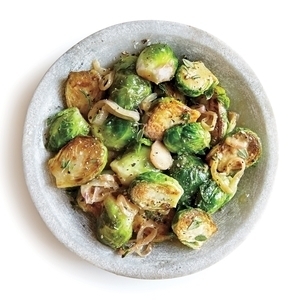 Add 1/4 cup stock to pan; cover partially, and cook 3 minutes or until Brussels sprouts are crisp-tender. Combine remaining 2 tablespoons stock, mustard, and honey in a bowl; stir into sprout mixture. Sprinkle with thyme. Cook 1 minute, stirring well.